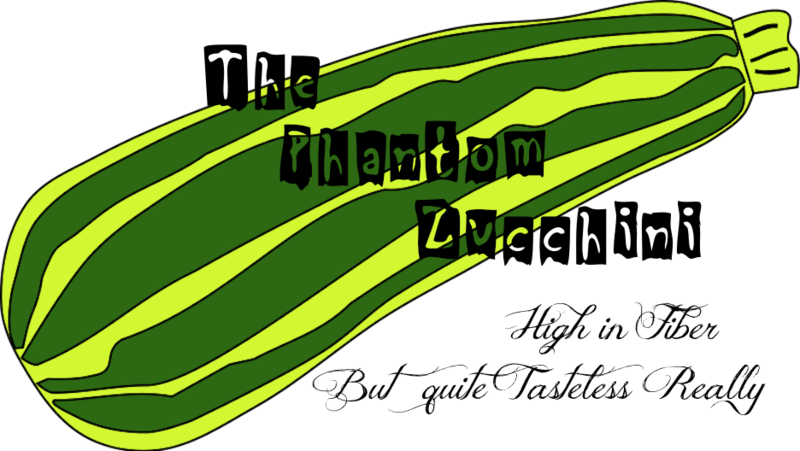 The Phantom Zucchini: So One Day I Picked Up a Rock On The Beach. They Say That's How it Always Starts. So One Day I Picked Up a Rock On The Beach. They Say That's How it Always Starts. I can be a little obsessive at times. In fact, if I had to name my decorating style, I'd probably most definitely call it Urban/Obsessive/Natural. What is Urban/Obsessive/Natural you ask? Well, let me tell you. My latest obsession is all things to do with nature, and I have this overwhelming desire to bring said nature objects into my urban condo. At first I believed it softened the urban edge of the place, along with the usual texture suspects, baskets, those crazy woven balls, etc. And they did. 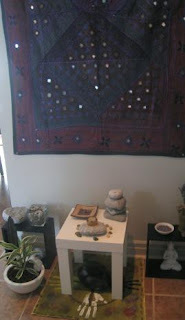 But if some rocks and shells and pieces of driftwood cozied up the place, wouldn't more do even more of the same? Well, yes. Perhaps. Or no, I'm just crazy. You decide because let's face it, blog readers are just as - if not more - qualified to judge the mental state of others than a licensed, highly educated psychologist with years of experience under her belt anyday. I never used to like the whole seaside decorating thing - those horrible nets hanging on the walls of rec rooms stuff with shells and starfish and those colored ball things turning the whole room into something terrifyingly reminiscent of the dining room at Cap'n Bob's Lobster House. But the other day while walking through The Pottery Barn store in the mall yes I know I told you I was never setting foot in the mall again so help me God but ok I lied to you and probably will again so get over it somewhere an d I saw a shell bowl. Yes, I said a shell bowl. And I know you're thinking "horrible" but it kind of wasn't, really. After all it was in Pottery Barn. So then I thought, maybe you just like it because it is in Pottery Barn and you firmly and devoutly believe that everything in Pottery Barn is more beautiful than the same thing anywhere else - even real shells wouldn't look as good as this bowl that looks like a shell. might be cool to put some sand in that bowl and then maybe some roc ks and then I could burn some incense in it and maybe stick some feathers that I found on the beach and maybe even a little tealight and it would be this kind of crazy shell creation that if nothing else would certainly raise an eyebrow or two and never let it said that I am a boring decorator. So anyway, this is what happened. Oh, but did it stop there? Heavens, no. 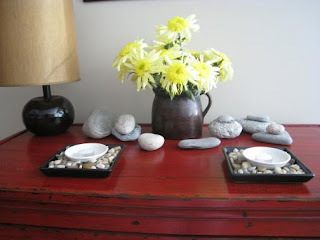 You see I simply had to bring in our home the many many large rocks I collected from another beach so that they could find their way into the nooks and crannies and even the buffet table in our dining area. I mean, really, if you hang this kind of a thing up on your wall you have to expect more kooky interesting stuff to follow, right? It only stands to reason. PS. 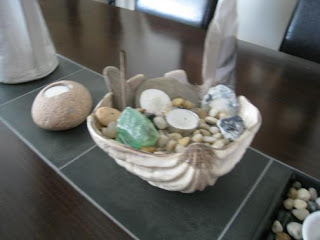 Did I forget to mention the stuff I took from the beach on our honeymoon that ended up on this windowsill display? Seriously I can stop anytime. We have so many damn shells in our house we actually rotate them. Our "summer shells" are out right now. I had forbidden Ryan from picking up any more, but he always seems to come home with his pockets full. 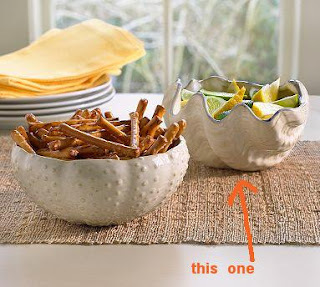 I love that shell bowl and I love what you've done with it. Maybe you could come over and give me some tips. I like to collect bits of nature too, but once I get it all home, I'm stumped. I currently have a huge terrarium filled with shells, rocks, and sand. Now what? Libby - ohmygod. Seasonal shells. Ok, so maybe I can have Halloween shells and Christmas rocks? JD, keep collecting them and then whenever you need a little something, create something out these items instead. It's kind of like the stuff you created at summer camp, only you're a lot older now so people will take you more seriously. Until you get even older and then they will put you in a home where you will again do crafty things.